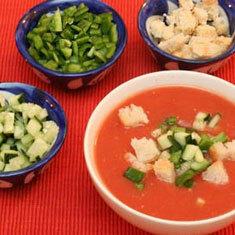 Summer’s here and Gazpacho is back on the menu. 200g stale bread (no crusts) soaked in cold water and then squeezed to remove excess moisture. Bung this all in the liquidiser and zap till you have a smooth paste/liquid. We then put it through a food mill to remove skins and pips – this is a matter of taste. If you want to have it as a soup you can tear up some crusty baguette or similar, dice tomatoes, cucumber, peppers and even melon to garnish and eat with a spoon.